Live comedy’s all about timing. 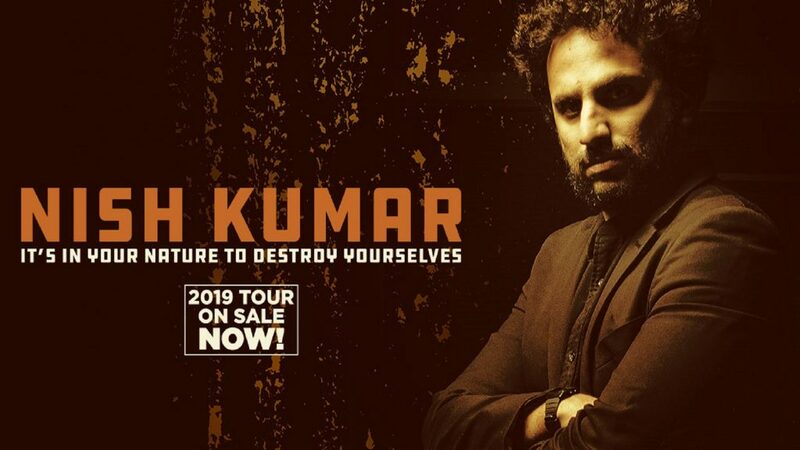 With ‘The Mash Report’, the 33-year-old Kumar has positioned himself as our prime political comedian, the only satirist doing what US audiences take for granted in ‘The Daily Show’. After a somewhat shaky start, it’s established itself as the only UK topical news comedy worth watching, although, at six episodes per season, can’t compare to its US equivalent. How to deal with an ever-changing political situation? A show written some months back might not cut it, and Kumar has a rep to maintain. The last week has been so tumultuous that I was curious about how Kumar would incorporate these farcical events into his set. I needn’t have been. He doesn’t. After a well-received warm-up set by Rosie Jones, weaponising her cerebal palsy, Kumar does go straight into Brexit, acknowledging that half the city voted ‘leave’ while pointing out that his audience consists entirely of ‘Guardian munchers’ who didn’t. We are, he points out, a so-called ‘elite’ that consists of brown people and teachers. But he’s off Brexit quickly. This is not the Daily Mash. The only up-to-the-minute material is about the Christchurch massacre and how the media treats white extremists very differently to Muslim ones. Generally, Kumar, points out, he has it easy, because he has a Hindu name. Which doesn’t stop him from being singled out at North American airports. Cue good anecdote. This was a sharp, engrossing, fast-paced hour and a half, with plenty about family and a strong take on happens when your comedic heroes turn out to have feet of clay. The Simpsons, obviously. He’s very upset about Louis CK but positively savage about Ricky Gervais’s pathetic lampooning of trans people. Many highlights include an encounter with Dominic Raab in the Question Time studio where Raab greets the first brown person he sees as ‘Nish’, despite his bearing no resemblance to the comic, and a history of the word ‘gammon’ in relation to Piers Morgan. The sweary show gets serious towards the end, when Kumar, acutely and economically, sums up how we got the double madness of Brexit and Trump. He should have stopped there, but doubles back to a black Jesus routine for the close, holding up placards of white actors who have played Christ, including, most ironically, Liam Neeson. It falls relatively flat, but that’s live comedy for you: he’s allowed to run out of steam. Outstanding. This review appears in today’s Nottingham Post. This entry was posted on Monday, March 18th, 2019 at 12:06 pm	and is filed under General. You can follow any responses to this entry through the RSS 2.0 feed. You can leave a response, or trackback from your own site.